A new alliance or united front organization was formed in January in Indonesia to fight the current neo-liberal policies of the Indonesian government. Its leaflet calling for a January 28 protest action lists 17 organisations. 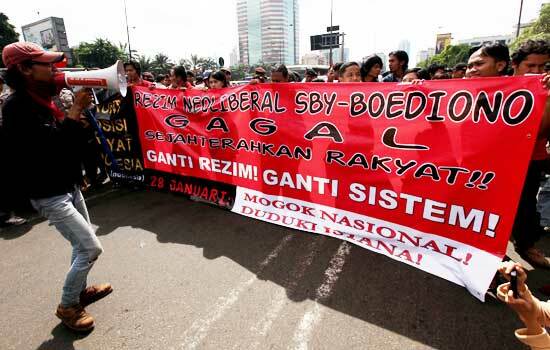 These include student and trade union organizations (including transport and electricity workers among others), women’s organizations, an organization defending the rights the victims of the 1965 repression and three left political blocks (KPRM-PRD and PPRM, PPI and PRP-Jakarta.) This is the first major attempt to establish such an alliance since the National Liberation Front (FPN) in 2008. Below is a translation of their call for action on January 28. YUDHOYONO’S NEO_LIBERAL REGIME HAS FAILED! UNITE AND TOSS OUT/REPLACE THE GOVERNMENT! ITS TIME FOR THE PEOPLE TO RULE! What kind of report card can this government be given as far as improving the welfare of the people is concerned? Over the last 5 years and 100 days, the Yudhoyono neo-liberal government has clearly failed to bring prosperity to the people. Its policies have not benefited the people. Electricity and fuel prices have been raised. Education has become more expensive because of commercialization. Fertilizer prices have gone up. The cost of all basic goods is higher. People have been pushed off their farm land; peoples homes have been demolished. Wages are low and out-sourcing of work has spread. Furthermore, if the China Asia Free Market agreement is implemented, our local farmers and producers will be threatened. This is what they call the neo-liberal road: a cunning tactic by capitalism to save a few big capitalists at the expense of the welfare of the poor masses. They use laws, ministerial, government regulations and all kinds of legal instruments to smooth the way for their anti-poor policies. We have been able to see over the last five years how this neo-liberal path, dictated by the international financial institutions and implemented obediently by Yudhoyono’s and previous regimes, has failed to improve the welfare of the people. The peoples’ suffering and misery increases. Realising that these policies will not benefit the people, the regime has started to try using low-level, low quality anesthesia on the people in the form of cash handouts and cheap basic commodity operations. The SBY-Boediono regime has also started to resort to the some of the New Order style weapons limiting democracy, limiting the freedom of the press, banning books, and other actions weakening democracy. In past elections (from the 2004 until the 2009 elections) the political elite and the people-deceiving political parties made so many sweet sounding promises of welfare for the people claiming too to be anti-neoliberal and accusing SBY-Beodiono of being the neo-liberals. But it turns out that it is easy to see that they are all “fake anti-neoliberals”: proven both by their behaviour when and power and since the elections. They have neither the capacity nor the will to fight neo-liberalism. They all depend upon and bow down to foreign capital. The elite political parties in the parliament (DPR) have been shown to be full supporters of neo-liberalism. No party has declared itself in OPPOSTION to neo-liberalism. The political parties in the parliament have only been interested in forming a big coalition, that is to say a POLITICAL CARTEL, to support the implementation of neo-liberalism in Indonesia. So too for the elite outside the parliament who have been busy form alliances with big business and those in power through the National Summit which was aimed at consolidating anti-people neo-liberal policies. So too it is true for the trade union leadership elite who joined them supporting the creation of a neo-liberal pro-investment climate. And so let us know leave behind these elites who only use the restless and misery of the people in order to gain seats in parliament and in the government as a means to enrich themselves. Let us only depend on our own strength, the strength of a united and self-reliant people. It is now time for the people to determine our own future, find our own road to prosperity, justice and equality. It is time for the people to take a clear stand and affirm their OPPOSITION to the neo-liberal government and to begin to unite all fight-backs through the formation of peoples’ opposition fronts. Land, technology and capital for the peasants, and so on. WE HAVE HAD ENOUGH! YOU ALL (THE NEO-LIBERAL REGIME) HAVE FAILED! WE UNITE NOW AND OVERTHROW/REPLACE THEM! NOW IS THE TIME FOR THE PEOPLE TO RULE! The Indonesian Peoples Opposition Front now makes a call to all the elements of the oppressed people: workers, farmers, urban poor and students, on January 28 let us show that it is the people who are the legitimate holders of power, by carrying out a national strike and by organising common protest actions at the centres of power (the palace and the governor’s offices). Come on, unite! Arise and join together in the Indonesian Peoples Opposition Front (FOR INDONESIA) in our respective regions. Through Indonesian Peoples’ Opposition Fronts let us save democracy and struggle for the peoples’ welfare in opposition to the neo-liberal regime. FOR INDONESIA, Jalan Diponegoro 74, Central Jakarta.